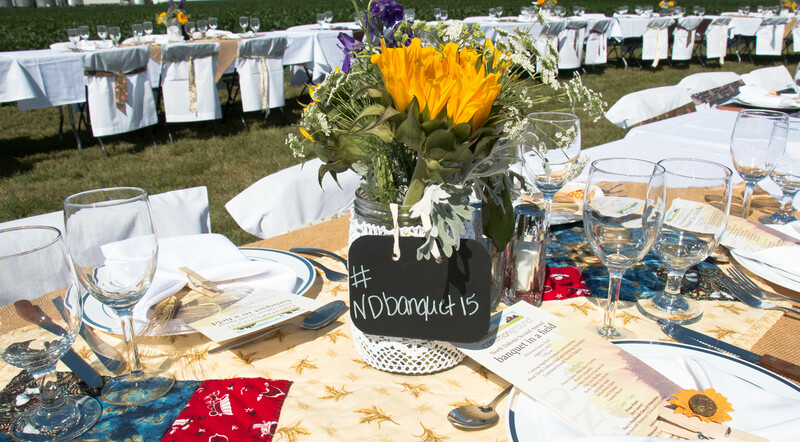 On August 4, 2015, CommonGround North Dakota‘s Banquet in a Field was held at Peterson Farms Seeds. I detailed it all here in this Agweek column. My column continues to be available every Saturday online and is now printed weekly. Agweek told me yesterday they think my column should be called “Pinke Post” and I agreed. So hop over to get the gritty, shorter details there of Banquet in a Field and I am including links to blog posts of attendees at the bottom of this post. This version is lengthy, unedited and rambling at times. However I know at least two of you want details to plan your own Banquet in a Field in your home area so I am sharing more details below. What is captured as a perfect evening for Banquet in a Field truly was. As one attendee said to me, “God truly blessed the bounty and the evening.” But there is months of work that goes into this event and I will never try to name off every person that contributes to making it work. It’s a small volunteer army along with dedicated staff from Peterson Farms Seed, the North Dakota Soybean Council, North Dakota Corn Growers Association and numerous other ag sponsors from around North Dakota. Even our own local livestock sales barn is a sponsor which I love! Despite all the collaboration and work ahead of the time, the morning of the event with coffee in hand as I drove from my friend Staci’s family farm where I stayed the night before to the Peterson’s farm, where the event is hosted, I had a flash of worry and fret. Everything on my checklist was either done or about to be checked off. But what if the volunteers didn’t show up? What if the attendees all cancelled? What if (fill the blank)? My fears were calmed and literally every detail came together. The little ones that didn’t, no one knew about. Like the thank you cards that weren’t printed that I was going to have done before the event. Now you know. 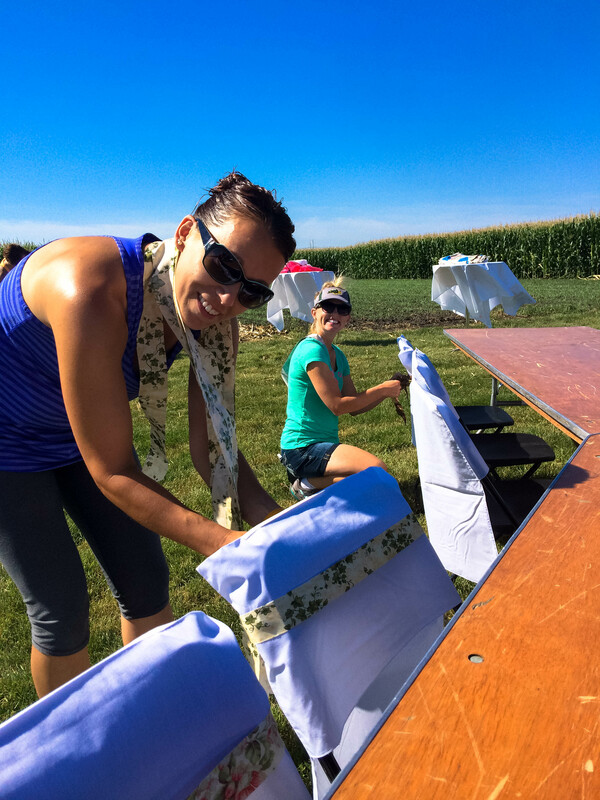 A rental crew set up chairs and tables and then it was up to our group to decorate and arrange. It’s a lot of work but this year was made so much easier than last year due to our small volunteer army! In a matter of hours, tables were decorated. The tables, chairs and overall decor is detailed and beautiful annually thanks to the years of sewing my mom did for different family weddings. Plus this year, we had a real deal event planner, Jakelle, who coordinated, ordered and made sure many details were covered for this event. I learned so much from her! I absolutely love that the look was similar to last year but that we changed it a bit and it seem to enhance the North Dakota farm field to plate atmosphere. 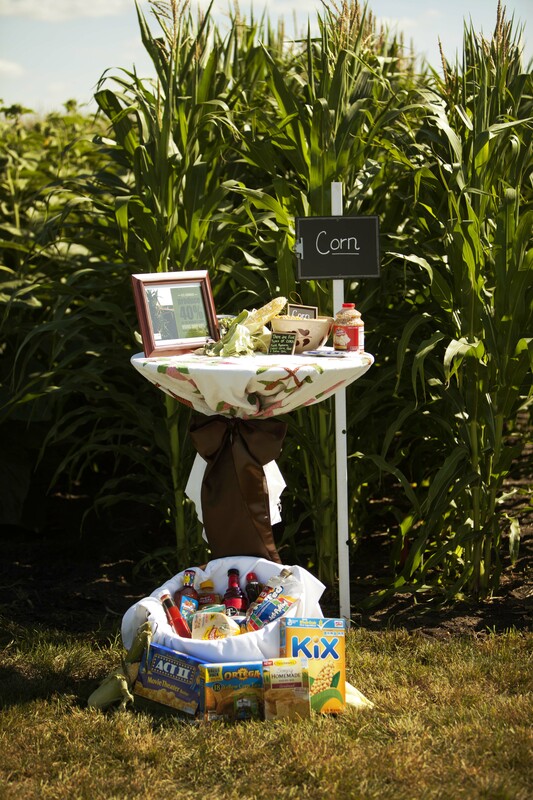 We added vintage and thrift store serving bowls, platters and plates to the decor this year. 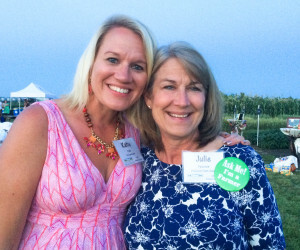 Thanks to my sister and mom for helping me find many treasures from Dickinson, North Dakota to Minneapolis, Minnesota. All food is served family style and the variety and character of the platters and bowls add an electic feel. 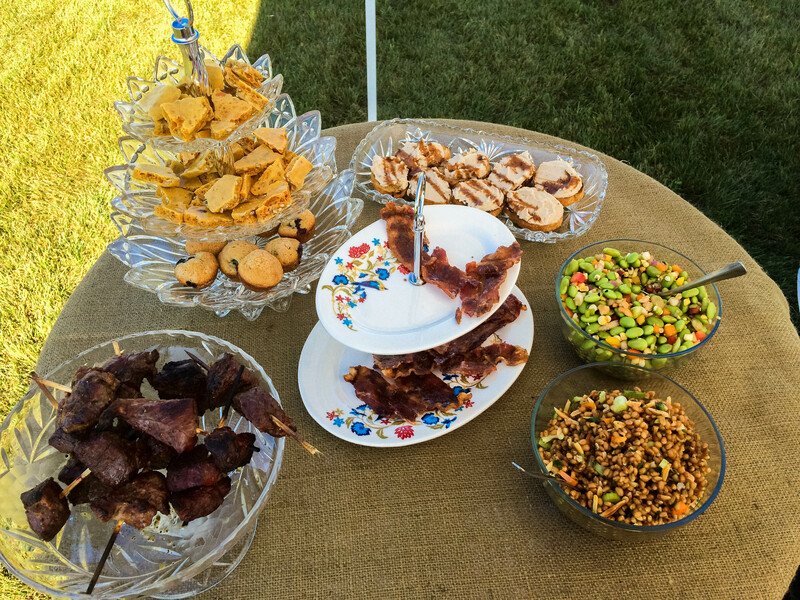 And as a lover of all things old, it was difficult on me not to keep all of these platters and bowls to myself. But instead, they belong to the event now and we will use them again. 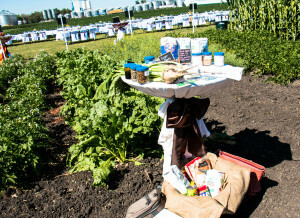 One of my assigned planning committee tasks are the appetizers tables placed in front of the eleven crops Peterson’s Farms Seeds plants. I bring the quilt tops of my mom’s for them. My friend Staci’s chair ties from her wedding are used. 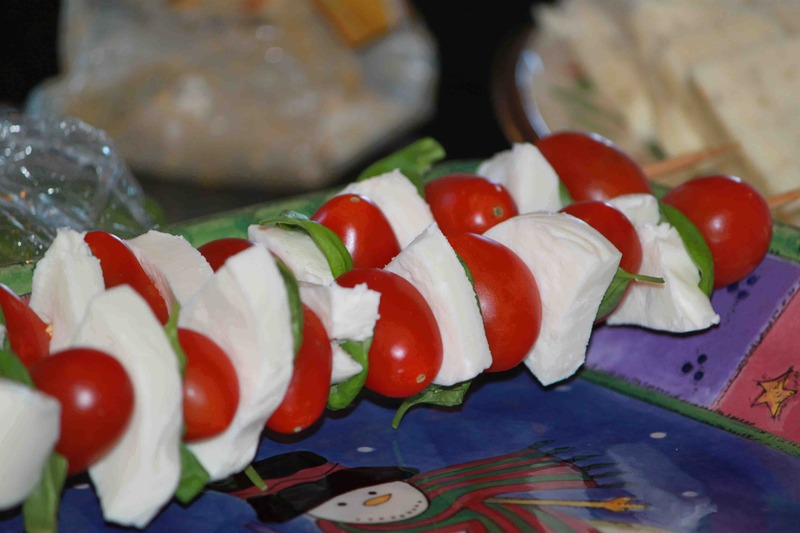 We decorate them with grocery store items that crop is an ingredient in or the raw product itself. 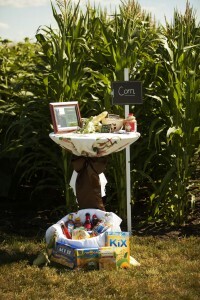 The crop and meats tables featured are one of my favorite aspects of banquet in a field. We coordinate farmers and ranchers to stand at each table and for an hour ahead of the five-course dinner the 120 attendees wondered between the plots of crops learning about each one, eating appetizers featuring those crops or meats and asking questions of the farmers and ranchers. What is accomplished in this hour of conversations could not be done in a year of social media outreach. Online is a conversation starter often times but I think getting offline builds a stronger relationship and dialogue and that is what this event does. Several of the North Dakota agriculture sponsors lined up their own farmers or ranchers to be at their featured crop or meat table this year so it was fewer people to line up for CommonGround volunteers. 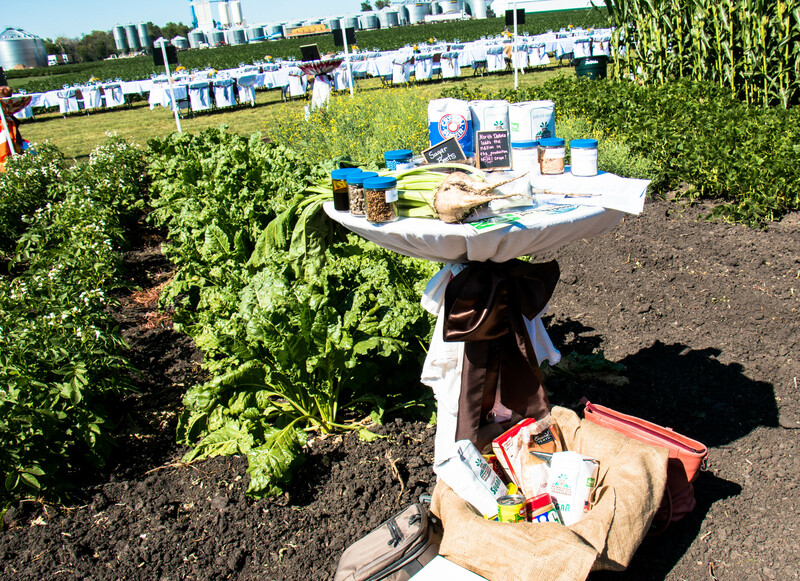 I had five crops to line up farmers for and then grocery shopped for all the tables to have the products on them the night before. It meant a lot to me that for Banquet in a Field my cousin Scott volunteered to be the sunflower farmer and cousin Mark the flax farmer, both of which they know a lot about and their wives, Elizabeth and Samantha, both dear friends and all Godparents to our daughter, Anika, drove to attend. I think we gained two new CommonGround volunteers in Elizabeth and Samantha. Plus we’ve all talked about what we learned together from this event to make it better for next year. 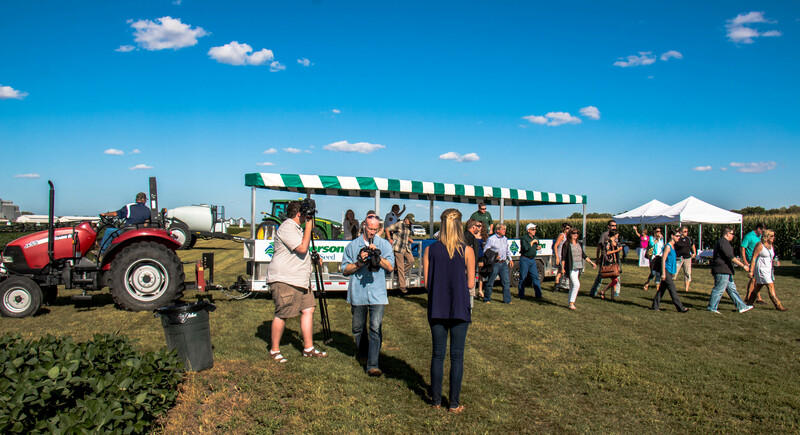 We wanted to make sure we captured the moments of the event and hired a rockin’ videographer again and when the video is done I will share it and tell you more about it. Here they are interviewing our chefs, the Nasello’s of Sarello’s, who put on quite the feast in a farm field. 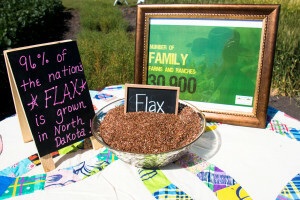 They are a delight to work with and as my Grandma Nola told me when she read their recap and Blueberry Flax Muffin recipe in the local newspaper, “They make you feel like you were there and really proud to be from North Dakota.” True. Nasello’s are not from farms and truly champion farmers and where food comes from. One aspect vital to the success of Banquet in a Field is our volunteers willingness to leave their farms and families to speak about what they do and why. I think it is easier most days to stay home, write, tweet, Facebook or hide away than speak out in public on issues that impact your farm and business. These are issues that make headlines but rarely does the media ask a farmer directly for their take. But our volunteers do it and they are willing to talk about the farming and food issues. 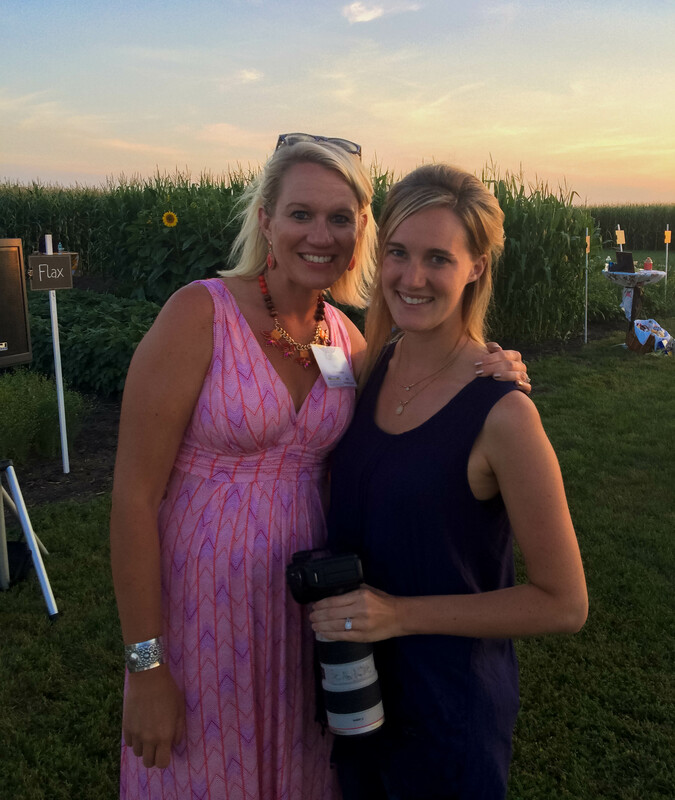 As the shuttles started to deliver guests I heard my prairie mama farm friend, Sarah, speaking to the shuttle groups about biotechnology, crop rotations, seed company signs, no-till farming practices, being a Maryland dairy princess turned North Dakota farmer, mom and wife and so much more. I bubbled with pride and excitement for the event. 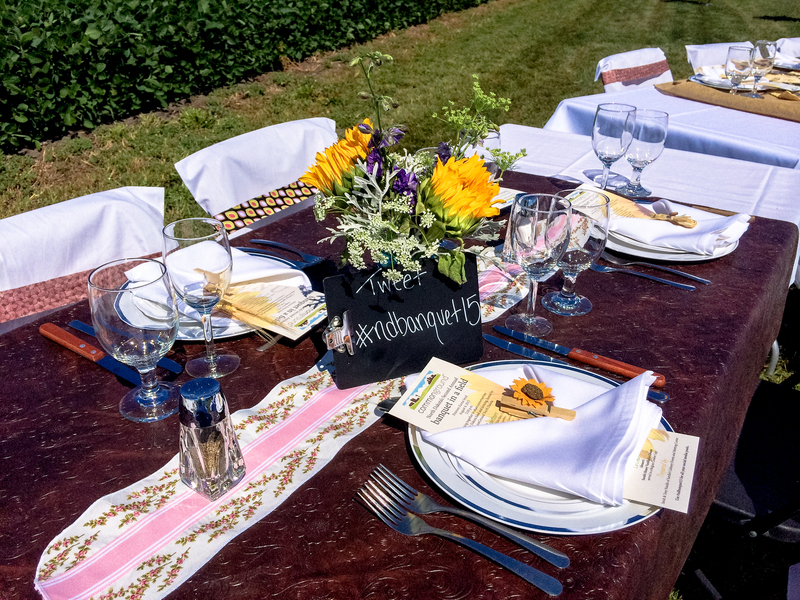 As guests walked up, every committee meeting, checklist and detail was worth it to be a part of something as spectacular as another beautiful banquet in a field. There were media, photographers and the video crew. 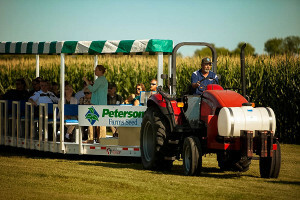 Most importantly, attendees, not connected to farms and agriculture, living 20 minutes or less from Peterson’s in and around Fargo, North Dakota, excited to attend. 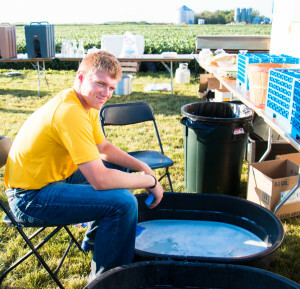 One FFA volunteer even had to wash the dishes in the field. (Actually they all helped and were amazing kids to work with!) Our son , Hunter was there from set up through tear down and a great asset. Plus his friend, Paige also came, set-up and served. Both are presidents of their high school FFA chapters this upcoming year. Local farm women from my south-central North Dakota area were there to set-up and support all the way through the event. And I have StitchFix for sending me a dress that I hadn’t even tried on or taken the tags off of but it was a lovely fit and worked perfect. When the sun set, I knew the day had been a success. But it wouldn’t have been done with the women and men behind the scenes. 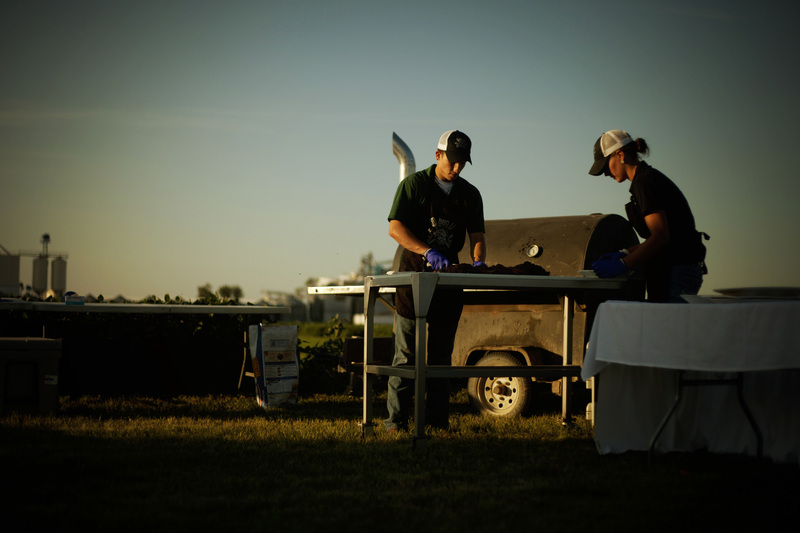 The ones willing to serve selflessly for agriculture, their passions and are gracious farm hosts. 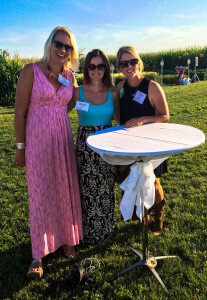 Banquet in a field connected me to Erin Ehnle Brown in real life for the first time. Erin recently married and moved to North Dakota. Her images stand out and having her as a part of our state and agriculture community is a gift. We will definitely work together again. 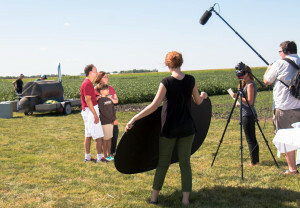 You can read more about Erin in the Women in Ag feature I shared about her last fall. 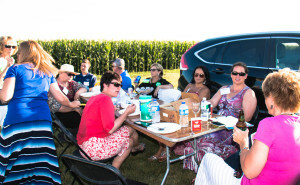 I tend to pace the event, never sitting and do not take enough group pictures while everything is happening around me. It’s a good thing to soak in the moments and conversations by being present and not distracted by photos too much. 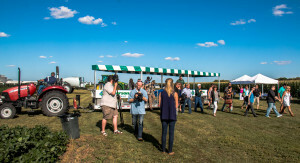 But we missed taking a picture of the North Dakota bloggers who attended! I’ve shared some of their posts below. 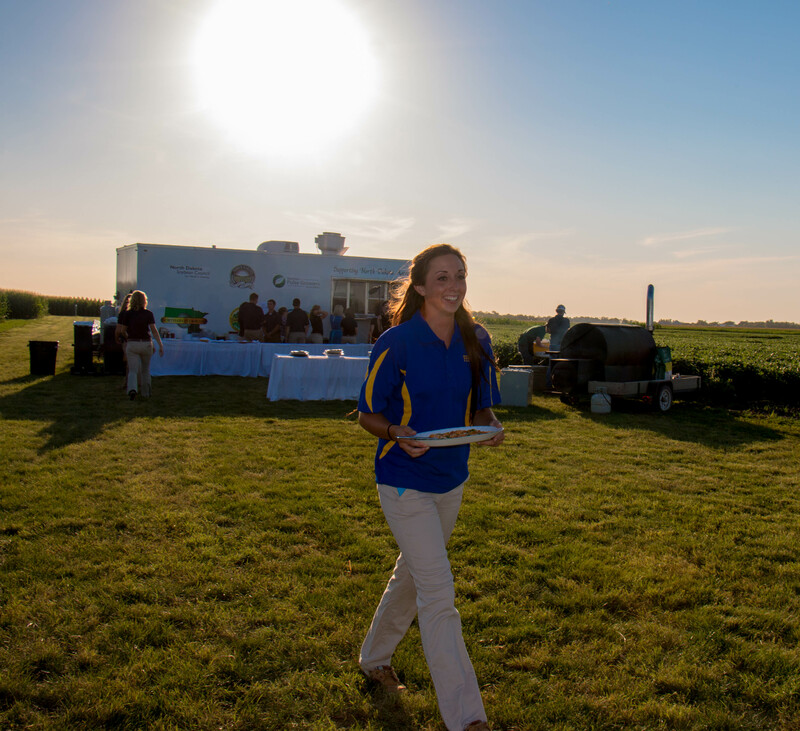 Overall, there is nothing more rewarding that I have done in agriculture communications and marketing work than Banquet in a Field. The dialogue, the conversations, the hard questions asked about farming practices, GMO’s, animal welfare, sustainability, everyday farming life, the costs, sacrifices and more. 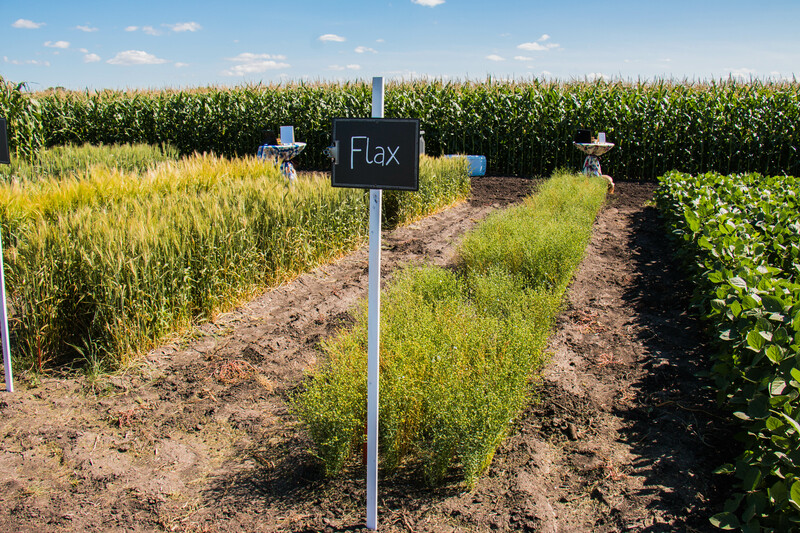 Nothing is avoided in conversation when it comes to agriculture. 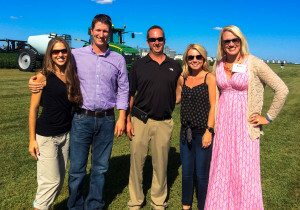 The conversations happen with real farmers and ranchers who genuinely care, give of their time during harvest and follow-up with people they’ve met, inviting them often for a farm or ranch tour or fall combine ride. I am grateful for 100 plus attendees not from agriculture who make a commitment to attend. These people make the event. 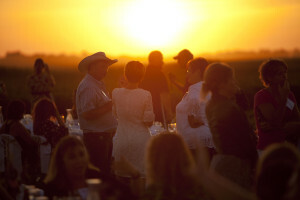 Agriculture people hosting a banquet to talk to themselves would not serve our purpose. 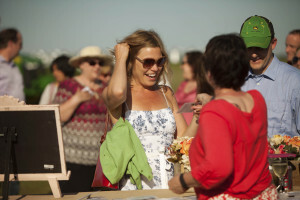 It’s connecting to the non-farm consumers who want to simply know a farmer and where their food comes from that matters most in this effort and event. That’s why I hope we put a date on the calendar for next year and do this all over again. Banquet in a Field, take three. 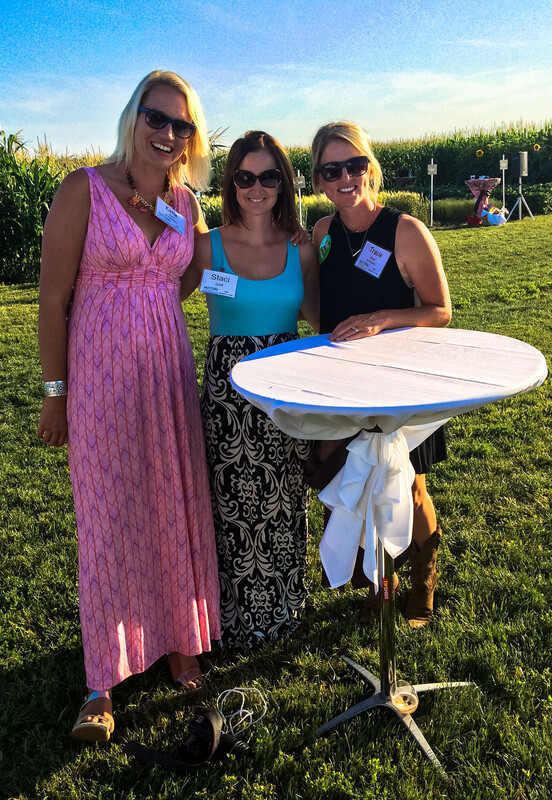 For full disclosure, I am the statewide CommonGround North Dakota coordinator, coordinating farm women volunteers and about six events or projects we do a year around the state. I am not paid to write this blog post. 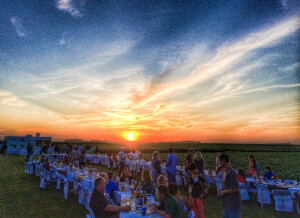 It’s my passions and my loves for land, crops, food and people who all come together in Banquet in a Field that I wanted to share with you here. Everything looks lovely & your passion shines through! I’m hoping to make part three next year. What an awesome showcase.